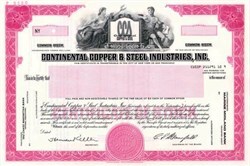 Beautifully engraved SPECIMEN certificate from the Continental Copper & Steel Industries, Inc. This historic document was printed by the Security-Columbian United States Banknote Company and has an ornate border around it with a vignette of the company logo between an allegorical man and woman. This item has the printed signatures of the Company�s Chairman of the Board and Secretary. CCX Inc. has brought together three unique and individually successful companies. Each has proven itself to be a leader in their respective markets through innovative processes and manufacturing capabilities, quality development and control, and distinctive sales and marketing programs. Over the past 100 years, CCX Inc. has experienced unprecedented growth. Through their Hanover Wire Cloth division and CCX Fiberglass Building Products division, they've become the world's leading designer and weaver of metallic and non-metallic mesh products and industrial fabrics. CCX Inc. currently operates three state-of-the-art facilities � Hanover Wire Cloth, CCX Fiberglass Products and Braeburn Alloy Steel. The weaving facilities alone encompasses more than 780,000 sq. ft. of space.